Marble and granite are both popular choices around the home, and offer an affordable elegance. Surrey Marble and Granite provide high-quality stonework for a wide range of applications, from domestic kitchens to commercial flooring. For many of our clients, choosing a kitchen counter, bathroom tiles or office flooring is the first time they have considered the properties of marble and granite, and they find it hard to make an informed decision. Our staff are experts in the stones and finishes we offer, so if you have any further questions, don’t hesitate to contact us. Different materials have different appearances and cultural connotations. Marble and granite have distinct histories and, whether you’re decorating an office or your own kitchen, those are important. Marble has been used as a luxury material for centuries, and brings that classical elegance with it to any setting. It also has a distinctive veined look which is hard to replicate. Granite is a more modern material, often used in up-to-the-minute designs. It’s appearance is more varied, often more colourful, and without the distinctive veining. While marble and granite are both natural stone, they come in a very different selection of colours and patterns. Marble forms with distinctive veining. The veining is unique to each slab, which means that matching patterns from slab to slab is nearly impossible. Granite, on the other hand, has a more consistent overall pattern. This means that different pieces of granite can be joined without creating a visual break, while marble is better used as a whole piece or distinct, individual tiles. 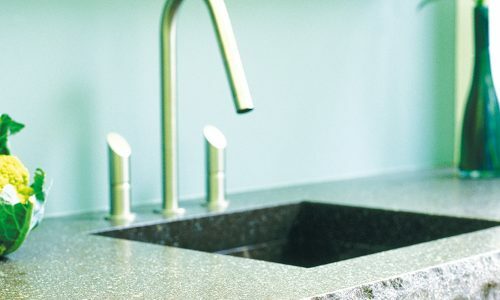 Over small areas, such as a table top, it is possible to custom-shape a single slab, while over larger areas, granite is easier – and thus cheaper – to match. Marble and granite are both stone, and as such are naturally hard and durable. Both stones are heat, water and scratch resistant. There is no reason that a marble or granite floor or fireplace shouldn’t outlast the building which houses it. Granite is an incredibly hard material and can withstand rougher treatment. Marble is a softer rock, and is thus more likely to chip or scratch. It is also more porous, and thus can stain or wear if left unsealed. Modern sealants significantly reduce the chance of staining and are thus highly recommended. Both marble and granite are fundamentally low-maintenance materials, and in most cases basic cleaning and mopping up spills is enough to keep your stonework looking its best. How much wear marble or granite appears to suffer depends on the finish. A highly polished and unsealed finish will eventually dull as the surface suffers tiny scratches and abrasions. This can be repaired, should the problem arise, and modern sealants create a longer lasting finish. Rougher finishes, which often still feel smooth to the touch, have less shine but will remain unchanged for longer. Marble is also at higher risk of staining than granite, particularly the pale shades.